The official preview is now available for this week's Weekly Famitsu magazine and it shows that there will be a feature on the new moves for Toshiie, Matsu and Shingen as well as the unveiling of the final four DLC tie-in costumes. Most importantly, Matabee is now an actual dinosaur. 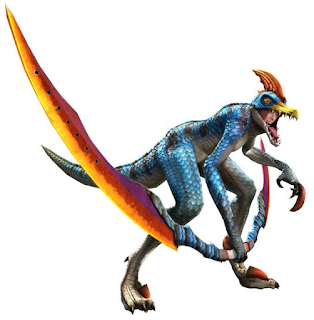 According to people who probably know more about Monster Hunter than I do, Ashikaga Yoshiteru (?) might be dressed in Silver Sol (Silver Rathalos) armour, Shibata Katsuie is in Reia (Rathian) armour with an Insect Glaive, Ii Naotora is in Kirin armour and Gotou Matabee is a Dosuranposu (Velociprey Velocidrome). The full details will be available once the magazine goes on sale on Thursday. 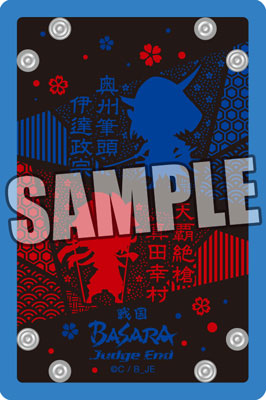 AmiAmi has posted details of another new Sengoku Basara Judge End merchandise item: a colourful accessory pouch. It's priced at ¥972 and due for release in late August 2015. 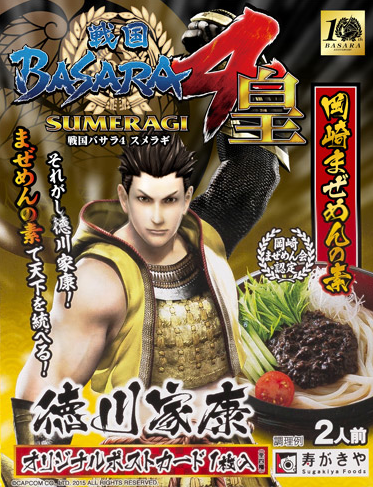 Are you ready... for Ieyasu noodles? The latest character to join in with the Sengoku Basara tenth anniversary celebrations is Tokugawa Ieyasu, who has teamed up with Sugakiya Foods to release a Sengoku Basara 4 Sumeragi Collaboration Packaging version of Okazaki Mazemen Stock. Mazemen is a dry noodle dish which happens to be a local speciality in Ieyasu's birthplace of Okazaki. The stock in the pack is made with the famous hatcho miso, which has a long tradition stretching back to the Edo period. You can serve it with your favourite noodles to create a tasty dish steeped in local history. The packs of noodle stock will sell for ¥380 each when they go on sale in the Chuubu area from 21st July 2015.